A warning sent to teams prior to the start of the race failed to prevent a string of high-profile drivers breaching the pitlane regulations at the WD-40 Phillip Island 500. Front-running contenders Scott McLaughlin, Shane van Gisbergen, Mark Winterbottom and Craig Lowndes were among those handed 15 second penalties during the race. 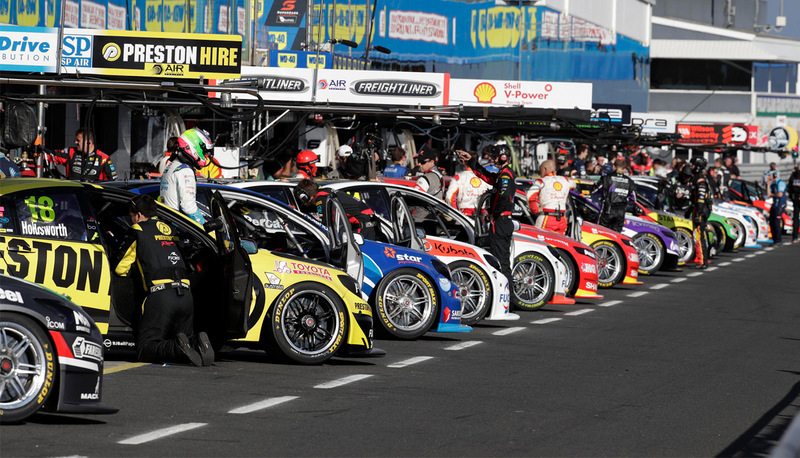 Each had been deemed to have breached rules stipulating that cars must remain wholly in the fast lane unless they are within two pit bays of their own garage. The topic had been raised privately with officials by Prodrive this morning, with the team requesting that a cone be placed to mark out the start of the dashed line separating the fast and working lanes. While no cone was installed, a bulletin was sent out to all team managers just under 90 minutes prior to the start of the race to reaffirm the existing regulations. “For the avoidance of doubt, the dashed line in Pit Lane delineates the fast lane from the working lane,” read the bulletin. Prodrive’s Mark Winterbottom finished eighth after his penalty and later lamented the lack of a cone to distinguish the lanes. “The blend line normally has a cone where you blend in and when you're following a car you can't see where you're going so it's a pretty steep penalty,” said Winterbottom. Triple Eight drivers Lowndes - who took the chequered flag first before falling to 12th once his penalty was added - and Jamie Whincup both said they were unaware of the potential issue before the race. “We didn’t talk about it in drivers’ briefing so I don’t know where it came from,” said Lowndes. “It hasn’t been discussed at all,” added Whincup, who was not found to have breached the rule and finished second. “I have been running on the inside of that line for years. Everyone has been doing it and they never said they were going to police it at all. Fellow Triple Eight driver van Gisbergen was also scathing of the penalties which came on a day where the Holden squad had avoided tyre issues that struck the bulk of their rivals. "In all honesty, it's crap. The penalties being handed out were ridiculous,” he said in a team statement. “Crossing the line at pit entry is something that happens at every track, and the process is different on every track, yet now they decide to police it in a way they have never done here before. McLaughlin said he accepts the penalty but added that he was confused by how it played out. “I’m a bit weirded out by the whole thing but at the end of the day the rules are the rules and I broke them,” he said.